Our Fiber Junkies group met last week to learn how to make/carve our own stamps, taught by our member Carol Sloan. It's great fun and very relaxing. There are many things you can use to carve stamps - one is called Easy Cut and it IS easy to cut. The downside is that it crumbles easily. I did this stamp (on right) years ago and the corner's have broken off, so don't know if I would use this material again. Another material is linoleum (below, left) and quite difficult to cut. There is also "Easy to Cut Lino" which I haven't tried yet but am sure is easier than regular linoleum. A great, fun and easy to cut surface is a gum eraser. The pink erasers are more dense than gum erasers and probably hold up longer. The main drawback is the size - very small so they have their limitations. "Mastercarve" is my favorite material for carving. It's available in art stores and often craft stores. It's easy to carve and doesn't crumble. You can buy a big piece - 9" x 12" or smaller pieces. Another plus - it's thick enough so you can carve every side, which we did making it more economical. You can also use rubber gaskit material from the plumbing department of a home improvement store. It was an interesting material, a little more difficult to cut and quite thin so you could only use the one side, but reasonable in price. We all used the Speedball cutter which is easy to use and find. I like the fact that it has many interchangeable tips for cutting different width lines. Designs for stamps was next - wow, the ideas are endless. If you can draw, you can rely on your own abilities. You can also use books or other sources - they're everywhere. One idea was to scan a photo, put it in a photo editing program and turn it into a line drawing. The Dover coloring books full of copyrite free images is another possibility. Below - a page from one of their books. There were several ways to transfer the image for carving. One method was to use an image printed from a laser printer. You need the toner so an inkjet printer won't work. Place the image face down on block. Wet a cotton ball with Acetone - nail polish remover and gently rub over the back of the image. The Acetone will release the image onto the block - not perfect but clear enough for carving! There are times when using a laser image isn't convenient and you want to do it NOW! An alternative to the above is to color the back of an image with graphite. Everyone has a pencil around the house, so this is easy. If you have one with exceptionally soft lead - even better! Turn the image over, place on material to be carved and using a stylus type of instrument, firmly press along the lines of the image. The image is transferred very easily. One of my favorite things about hand carved stamps is something called "Eraser Trails". When carving away the negative space to make the image protrude more, oftentimes, there are lines left behind. It's impossible to get the negative space perfect. These lines show up when you print the stamp.The stamp below is one I carved awhile back with eraser trails on it. and press onto fabric. Sometimes, it's more effective to lay the stamp down as you see above (right side up) with the fabric on top and press. Both produce an image but the latter seems to have a darker image. and carve a stamp using this image. I know - why would you do this with a pre-cut stamp. Well, if you love the look of the "Eraser Trails" and happen to like the pre-cut image, it's an interesting way to go. I do love the look of handmade stamps. Purchased ones are nice, convenient and have their place, but there's nothing that can replace one made with your own hands. I'm up to the the point of beading the Wedding gown. It's time consuming but also very therapeutic. I can see why people like to do this. 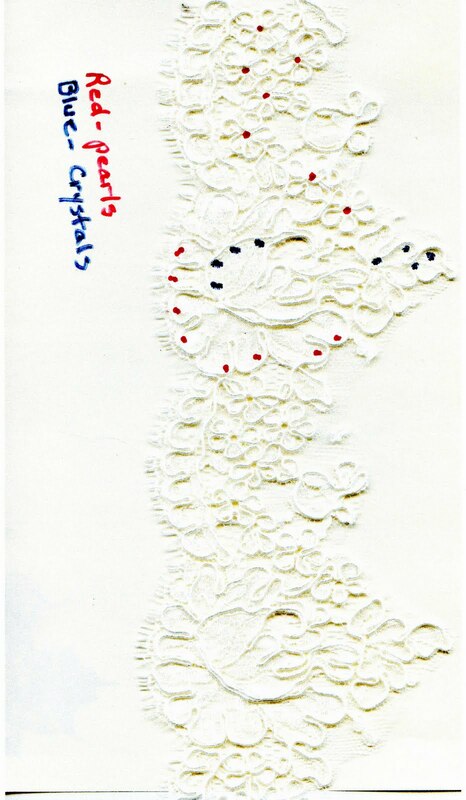 I placed my order for beads - the Swarovski crystals and pearls in both white and parchment. 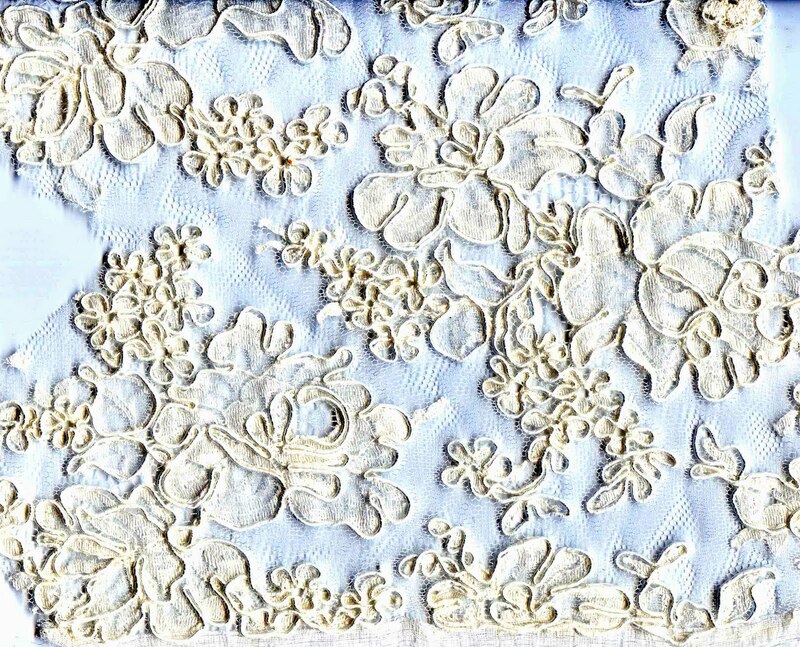 It's a really pretty mix on the lace. I know I'm obsessive but I just had to know how many beads were going on this gown. I ordered 25 packages of crystals (48 to a package) and 36 strands of pearls (100 to a strand) which totals 4,800 beads + the samples I ordered initially which I'm using - so probably over 5,000 beads. If anyone would have told me ahead of time, I'ld be sewing that many beads on this gown, I would have fainted on the spot"! You would think that many beads would weigh the lace down, but not so. They came in a "teeny tiny" box and weighed next to nothing. 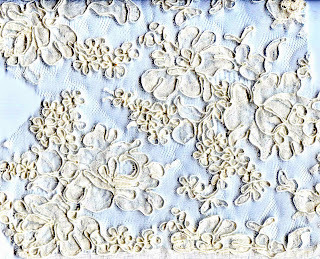 The border lace (removed in the beginning) was easy as it was so portable. 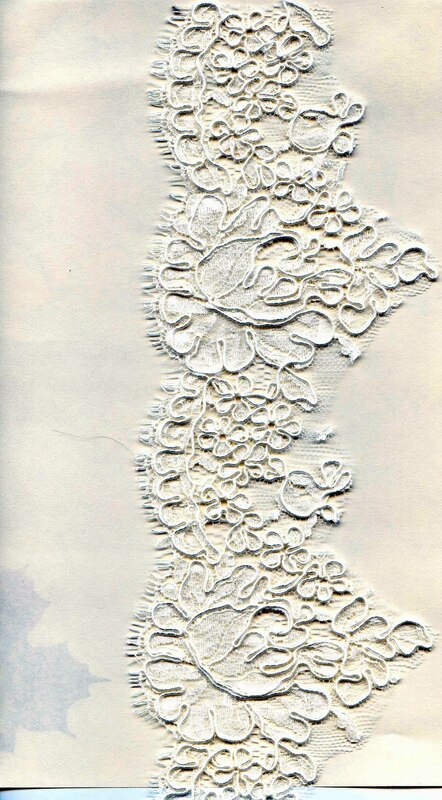 I scanned the lace (below) so I could have a reference to plan the beading sequence. I marked red for pearls and blue for crystals. This was the only place I could do a repeat which was nice - a no brainer kind of thing. but that didn't work as far as working up a beading plan. That was because I used different combinations of motifs each time I beaded an area. Instead, I outlined the area in black thread to make it more visual for me to see. I laid the lace part of the gown on the floor (on a huge sheet) and marked off areas for beading in black thread. I took into account the way the beading would flow into the next area. I put the lace on the dressform to see how it would look on a body. I know it's not smart to mark in a dark thread as the lint from the thread catch in the fibers and be obvious. But I used a good quality thread (less lint), did a single thread basting and a very loose stitch through the lace. It was easy to remove. It was also a great visual to see exactly where the beading would go. As each area is completed, I've removed the basting thread with a big smile - one more down. I must say, it's coming out very pretty, I think the beading makes the gown. A downside is my eyes get so "blurry eyed" from doing such fine work; I do have to take lots of breaks. I have a new appreciation for people who do this kind of work - for me it is definitely a "Labor of Love". Back to the beading board. Hope you're loving this wonderful, sunny weekend! It's always the most magical day when Fiber Junkies meet. We have wonderful Show and Tell and a demo/project - this month, carving stamps taught by Carol Slaon. Carol is a mixed media artist whose talent is amazing. She's very spontaneous, thinks outside the box and works with the neatest and sometimes most unusual materials. She brought some synthetic fabrics she dyed/painted to show. 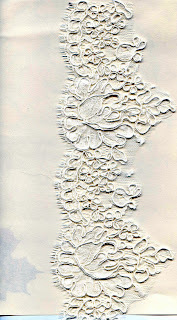 Carol loves working with paper - all kinds, and likes to use paints, dyes, drips of each to create her own unique look. She does lots of layering of processes to give each piece dimension. Oftentimes, these pages are used to make a journal. This old book was purchased at a Thrift store - the back and front cover removed to use in making a journal. I love the imagery on this book, a trip down memory lane for me. And the back - Carol then binds her hand made pages along with "recycled" covers into a journal for herself. 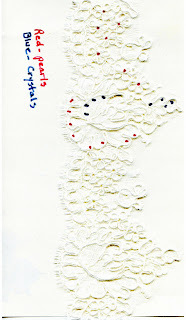 I also love her embroideries which she'll use in her art pieces, no patterns - just doodling with a needle and thread. Nancy B made her a present of a box to hold her treasures among which was a "Bug Wing" - you read that correctly. Carol loves bugs and bug parts to use in her art. I do have the most interesting friends. And I'm thinking, hmmmmm - Carol is pretty, fun, loves bugs and bug parts. Is this every little boy's "Dream Girl" or what! Stay tuned for more on Fiber Junkies. I had the great fun of presenting a lecture and workshop last week at the Western NC Quilt Guild in Hendersonville, NC. The guild is large, very active and also very enthusiastic. It's always nice to present your work to a room of smiling faces. I was able to get a few pictures at the meeting. I loved the color movement in this piece! The next day I taught a workshop called "Luscious Landscapes". Students were to use a photo to recreate a landscape in fabric. There were many fun texture techniques that were demonstrated such as fabric and thread crimping, thread fuzzies and twin needle work. We also touched upon using sheers such as tulle for shadowing and Angelina fibers for creating shimmer on mountains and water. This is just the starting point, can't wait to see them finished! I didn't get all the names that went with each piece everyone gave me the go-ahead to post their piece in progress. The fabric choices were great and so interesting. In this next piece, you can see the use of "tulle" as a mountain giving a sense of distance to the piece. Off to a good start, I love the sky and waterfall. The large tree in the foreground gives wonderful dimension to the piece. I also love the autumn color. I love all the greens and shadows in this next piece. Pat did this next piece, what a wonderful color eye she has - such an unusual combination of fabrics that work so well together! Mary started this next piece based on a photo she took while in New Zealand. She plans to put some Angelina on the mountain tops to look like "glistening snow" - how cool is that! Sarah started this next piece, all fussy cut. It will have a lighthouse in the foreground. A beauty in person. So, All my ladies - if you're reading this, I look forward to seeing your finished pieces. They're all so different, unique and wonderful (like yourselves). to glorious this! Yes! Is there anything more exciting than these pretty little crocus popping their heads through the soil? And Daffodils, so sunny and happy - reminds me of a story of long ago when I taught Home Ec. I was in a new school in a beautiful classroom on the main floor. The one side of my room faced into a small courtyard. You could get to the courtyard by going through a window in my room or the room next door. I don't know if that was intentional or a faux pas on the part of the overall design - either way I loved it. I felt like the courtyard was mine and mine alone. Someone early on planted hundreds of Daffodil bulbs in that area and every spring, it was ablaze with color. One of my students would happily oblige me by climbing out the window to pick lots and lots of these lovely flowers and then back through the window with an armful of sunny Daffodils. It was quite the adventure and a break from classroom work. The flowers were always on my desk and many bouquets were delivered to my teacher friends throughout the building. Needless to say I was very popular in springtime!